One of our favorite things about traveling is meeting great people who are making their visions real. 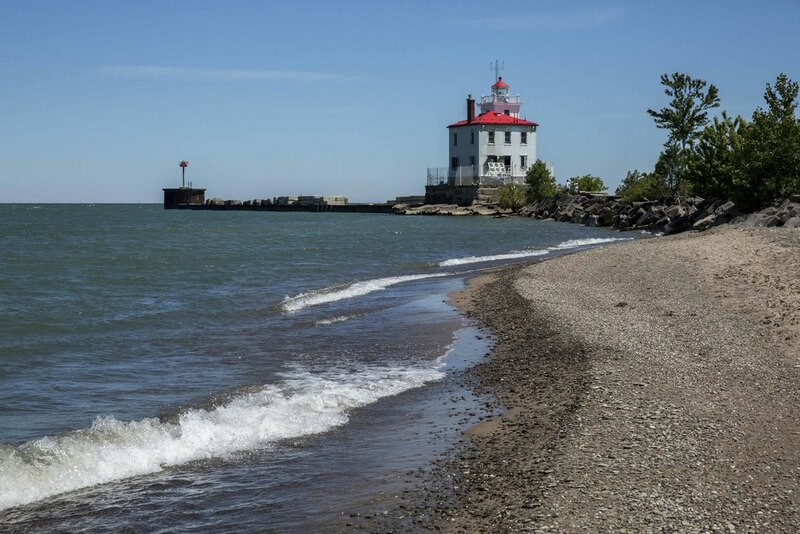 We kicked off our Great Lakes adventure with a visit to the Fairport Harbor West Lighthouse and a chat with the lighthouse owner, Sheila Consaul. Sheila purchased the 91-year-old lighthouse in 2011… she had a vision and has spent the last five years making it real… there’s still work to do, but WOW has she come a long way! The first thing that struck us about lighthouse living happened before we got to the lighthouse… it’s hard to get to! As we walked along the beach and the rocky break wall leading to the lighthouse we couldn’t help but imagine how hard it is just to get to and from shore… the renovation must be challenging and living there couldn’t be easy… clearly passion and purpose are driving this project! The lighthouse is a square structure painted white with red peaks and looked beautiful against the blue sky. As we approached the lighthouse we met Lucy, Sheila’s dog, and got a sense of a home, not just a lighthouse. Sheila greeted us and invited us in… for the next couple hours we learned about history, historic restoration, design, how to become a lighthouse owner (no, we’re not thinking about buying a lighthouse, but it’s really interesting none-the-less), and the challenges to bringing the lighthouse up to date. But more than anything, we were inspired by Sheila’s passion to make her vision real. 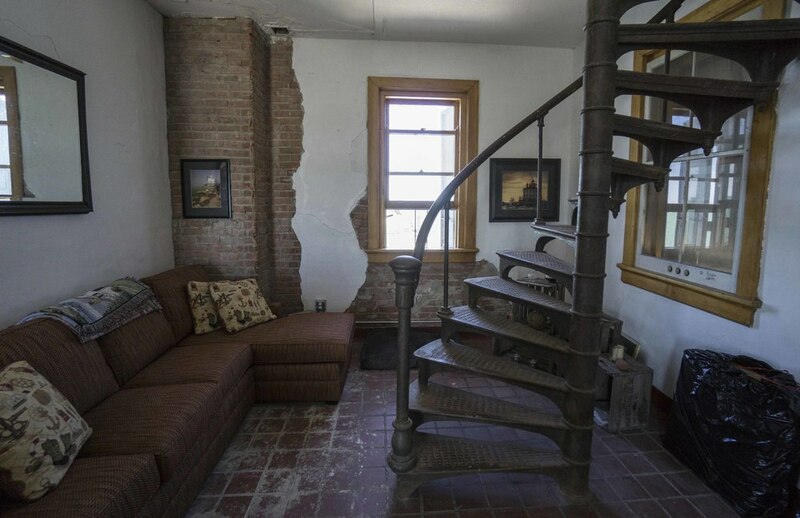 When Sheila took possession of the lighthouse it had not been lived in since 1948. We asked her how she felt when she was able to tour the lighthouse for the first time… it must have been daunting! Sheila said that though there would clearly be tremendous work ahead she was very pleased with the structure and the spaces. From there, she’s turned it into a beautiful summer retreat. She has maximized the big, open, square spaces with lots of windows to create living spaces that feel relaxed and maximize the surrounding beauty. 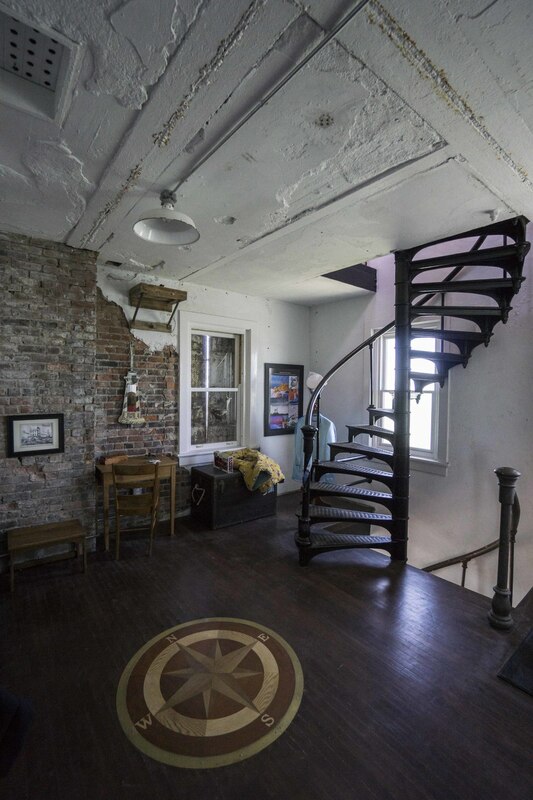 She’s also preserved some of the artifacts she’s found and has sourced much of the furniture from all over the US to create a feel of what it might have been like when the lighthouse was inhabited before. We talked a lot about the progress of the renovation and making the lighthouse fully livable to today’s standards. The lighthouse now has electric powered by a generator and over time solar and wind power could be used. Sheila noted that her biggest challenge is water… currently there is no running water in the lighthouse. There are several solutions available, but quite involved from a regulatory standpoint. Sheila was able to install a composting toilet. The lighthouse still is a functioning lighthouse as well as an official weather station. We went to the top and saw the beacon and weather instruments, as well as the stunning views of the lake and the harbor. The lighthouse is an important part of Fairport harbor and iconic to the surrounding community. To celebrate the lighthouse’s 91st birthday, Sheila invited the community to visit and had over 600 people! Sheila’s work serves beyond her personal vision of a beautiful and unique summer retreat… her work is preserving history and a structure that’s a source of pride and tradition to many people. We asked Sheila about her long-term vision for the lighthouse… once the renovation is complete does she plan to open a bed and breakfast and/or rent it out? She said that she doesn’t plan to go the bed-and-breakfast route, but will consider renting it. It will be a perfect vacation rental – it’s very large and sleeps about 10 people! Not to mention the location in a beautiful state park with the longest beach in Ohio! What an amazing way to start our Great Lakes trip! We are grateful to Sheila for opening her home to us and spending the time to share her vision. She inspired us and we’re thrilled to meet other amazing people like Sheila as we explore the Great Lakes! Interested in learning more? You can follow “Fairport Harbor West Breakwater Lighthouse” on Facebook, @FHWBL on Twitter, and visit www.FairportHarborWestLighthouse.com .